It’s official. I’m obsessed with navajo plying. And with Southern Cross Fibre. 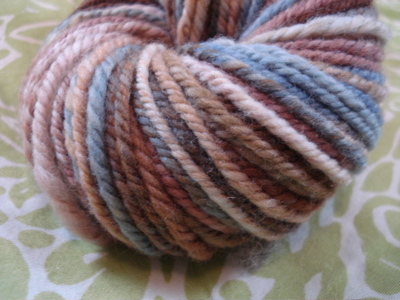 This merino might well be the squishiest thing to ever come off my wheel. 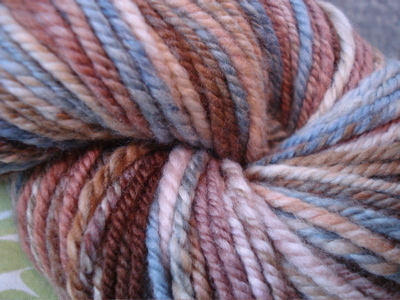 148 yards of plump worsted deliciousness, navajo plied, in the Bluestone colorway from the March 2010 SCF Fiber Club. I love this so much that I want to wear the hank doubled around my neck…and I’m thinking it should probably turn into a cowl, ASAP. 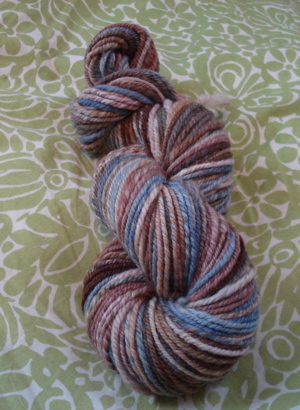 I went looking for something else to play with, and decided on this falklands wool from AVFKW in the tigerlily colorway. 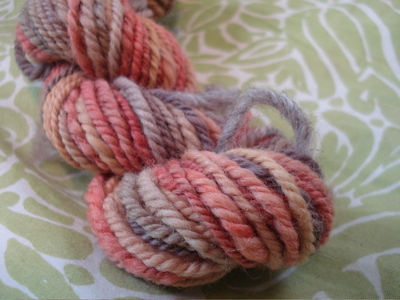 I split the roving lengthwise in half with the idea that the colors would repeat twice. And when I finished the first half, I decided to go for two mini-skeins so that I could navajo ply some more (instead of waiting until today). I wrestled with this in places — in some spots, my singles were slightly overspun for navajo plying, and my lack of patience meant that in those sections, I had to deal with energized singles that hadn’t been given any time to rest. 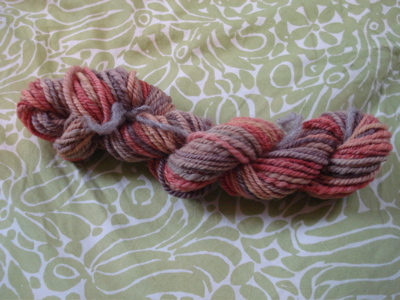 That said, I love these colors, and am psyched to spin and ply the other half of this fiber. 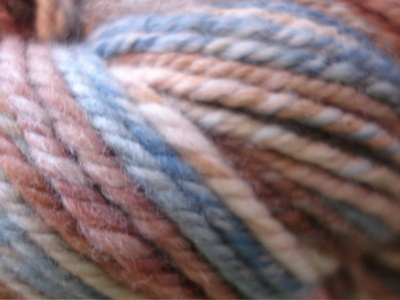 What you’re seeing here is 48 yards of worsted weight yarn, from 1.5 oz of fiber. 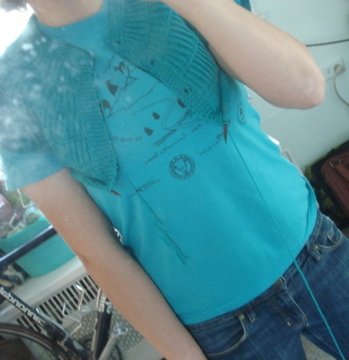 And here’s another shot of Shalom — I slipped this on yesterday to see if I wanted to add a fourth button hole (I do), and had to laugh at the exact matchiness of my t-shirt and yarn. This entry was posted in knitting, spinning and tagged AVFKW, bluestone, cardigan, cascade 220, falklands, FO, knitting, merino, navajo-plying, plying, SCF, SCF fiber club, shalom, southern cross fibre, spinning, tigerlily, worsted by barefootrooster. Bookmark the permalink. 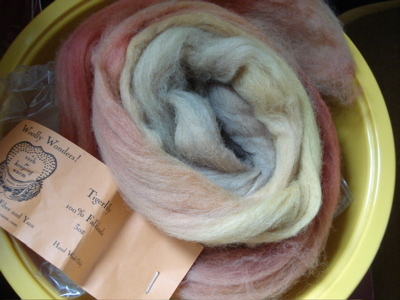 I haven’t tried either of those fibers yet, but they look amazing. You can never go wrong with teal-on-teal! I’m just starting a week off and I’m already dreading the end of it! Yours sounds like it was productive and relaxing. Shalom looks great – I need to make one. Between the SCF and the HY you will have some terrific fibers and here’s a little secret – they often combine beautifully…. Shalom looks fantastic – I love the colour. And I’m totally in awe of your amazing spinning skills – it’s so even and pretty. A cowl sounds like a grand plan. Hope the first day back isn’t too bad, funny that your school calendar isn’t tied in with Easter…. even though most universities here are secular, they always schedule our holidays over Easter (I suspect it’s because there are a few bank holidays over that weekend anyway, so this way they don’t have to give us any ‘extra’ time off for those! ).